It seems somehow fitting that the first and last attraction on our whirlwind Tennessee Tour consisted of finding and photographing the 'World's LARGEST Guitar.' Well, maybe we should clarify. 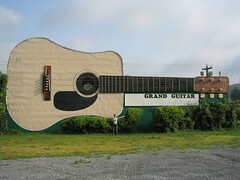 We've been calling it the world's largest guitar, because we have been unable to find it's equal elsewhere. So until a larger specimen is found, we will continue to give this guitar the superlative. Crossing over the Virginia border into Tennessee, the road weary traveler will find the Tennessee Welcome Center a very inviting place indeed. Sitting down under one of the sheltered picnic tables, I looked up to discover this guitar directly across the busy highway from us. What better way to start a roadtrip then to gaze upon such a masterpiece? It's a beauty indeed. 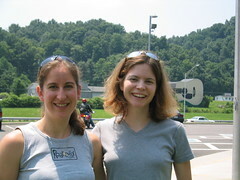 We have no rough stats and can't tell you too much about it, but as we left Tennessee 6 days later, we did pull off the highway and investigate. Roadside America reported that there was once a museum inside. Unfortunately, upon peering in the glass door in the concealed entrance we were dismayed to find only boxes of junk and cleaning supplies. The guitar is a Martin and is still in fairly good shape considering that it appears abandoned. Regardless, it's a beautiful example of true Roadside Americana. We were told that the museum has reopened!